This article is about the knit cap also known as a "beanie" or "tuque", among other names. For the head-hugging cap made of cloth panels, also known as a "skully", see Beanie (seamed cap). For other uses, see Beanie. "Tuque" redirects here. For the traditional chef's headgear, see Toque. For the Canadian city, see La Tuque, Quebec. A knit cap, originally of wool (though now often of synthetic fibers) is designed to provide warmth in cold weather. Typically, the knit cap is of simple, tapering constructions, though many variants exist. Historically, the wool knit cap was an extremely common form of headgear for seamen, fishers, hunters and others spending their working day outdoors from the 18th century and forward, and is still commonly used for this purpose in Scandinavia and other cold regions of the world. Being found all over the world where climate demands a warm hat, the knit cap can be found under a multitude of local names. Most knit caps are tapered at the top. The stretch of the knitting itself hugs the head, keeping the cap secure. They are sometimes topped with a pom-pom or loose tassels. Knit caps may have a folded brim, or none, and may be worn tightly fitting the head or loose on top. A South American tradition from the Andes Mountains is for the cap to have ear flaps, with strings for tying under the chin. A special type of cap called a balaclava folds down over the head with openings for just the face or for the eyes or mouth only. Some modern variants are constructed as a parallel sided tube, with a draw-string closure at one end. This version can be worn as a neck-warmer with the draw-string loose and open, or as a hat with the draw-string pulled tight and closed. The pull-down knit cap was known in the army of the British Empire as an Uhlan cap or a Templar cap. During the Crimean War, handmade pull-down caps were sent over to the British troops to help protect them from the bitter cold weather before or after the battle of Balaclava. The cap became popularly known a Balaclava helmet or just balaclava among the soldiers. In Scandinavia, caps resembling a typical knit cap with a pom-pom has been in use since the Viking period and quite possibly earlier. The term (Danish tophue, Norwegian topplue, Swedish toppluva) means "top cap", and refers to the pom-pom. The Rällinge statuette, depicting Viking fertility god Freyr shows him wearing a pointed cap with pom-pom. Early caps were probably sewn or made with nålebinding, but were knitted from the 17th century onwards, when knitting became known in Scandinavia. Inspired by the phrygian cap of the French revolution, it became largely ubiquitous during the 18th and 19th century. It is still found in many of the Scandinavian folk costumes for men. The precursor to the modern tuque was a small, round, close-fitting hat, brimless or with a small brim known as a Monmouth cap. In the 12th and 13th centuries, women wore embroidered "toques", made of velvet, satin, or taffeta, on top of their head-veils. In the late 16th century, brimless, black velvet toques were popular with men and women. Throughout the 19th century, women wore toques, often small, trimmed with fur, lace, bows, flowers, or leaves. The term tuque is French Canadian. Some etymologists think it probably comes from an Old Spanish word (toca) for a type of headdress — specifically, a soft, close-fitting cap worn about 500 years ago. The tuque is similar to the Phrygian cap, and, as such, during the 1837 Patriotes Rebellion, a red tuque became a symbol of French-Canadian nationalism. The symbol was revived briefly by the Front de libération du Québec in the 1960s. It is considered outerwear and is not commonly worn indoors. 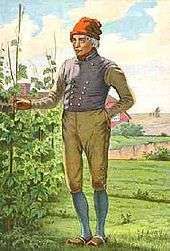 The word tuque is similarly related to the name of the chef's toque, an alternate spelling from Middle Breton, the language spoken by Breton immigrants at the founding of New France. In Modern Breton, it is spelled tok, and it just means "hat". In Old Breton, it was spelled toc. The word is also occasionally spelled touque. Although this is not considered a standard spelling by the Canadian Oxford Dictionary, some informal media polls have suggested that it is the preferred spelling by many Canadians. In some sections of Canada, a tuque with a brim on it, commonly worn by snowboarders, is nicknamed a bruque (a brimmed tuque). A bobble hat or bobble cap is a knit cap that has a yarn "bobble" or pom-pom upon its top. It is similar to watch cap, however, such a tuque does not have a bobble on its top. Bobble hats were traditionally considered utilitarian cold-weather wear. In the late 20th century, in the United Kingdom they (like the anorak) were associated with utilitarian unfashionability or with older football supporters, as they had been popular in club colours during the 1960s and 1970s. Along with the pin-on rosette and the football scarf, the bobble hat was seen as traditional or old-fashioned British working-class football regalia. Knit caps are common in cold climates, and are worn worldwide in various forms. 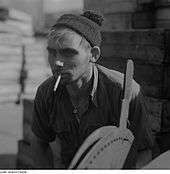 They have become the common headgear for stereotypical dockworkers and sailors in movies and television. Bill Murray wore this type of hat in The Life Aquatic with Steve Zissou, possibly as a parody of the red tuque (or Phrygian cap) worn by Jacques Cousteau. Famous media characters to sport a knit cap are the SCTV characters Bob and Doug McKenzie. Michael Nesmith of The Monkees also wore this hat in his television series, as did Jay in the films of the View Askewniverse, Robert Clothier's character "Relic" in the long-running Canadian TV series The Beachcombers, and Hanna-Barbera's character Loopy de Loop wore a knit cap as well. Michael Parks wore one as James "Jim" Bronson in the popular series "Then Came Bronson". Robert Conrad also had worn one in his role of coureur des bois in the epic TV series Centennial. Bruce Weitz's character Mick Belker wore this hat throughout almost every episode of Hill Street Blues. Characters in the animated series South Park, including Eric Cartman and Stan Marsh, usually wear knit caps. Jayne Cobb from the TV series Firefly wore an orange sherpa knitted and sent him by his mother in the episode "The Message". The character Compo on the British TV show Last of the Summer Wine is almost always seen wearing a knit cap. 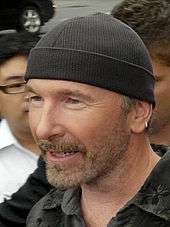 The guitarist for the Irish band U2, The Edge, is also known for wearing a knit cap while performing, or during interviews. Tom Delonge, guitarist and vocalist of the pop punk band Blink-182 is also known to wear a knit cap during live performances. Rob Caggiano, music producer and former guitarist for thrash metal band Anthrax, is often seen wearing a black one. Canadian Daniel Powter also wore a blue knit cap during the music video for "Bad Day". Knit caps are also worn commonly by hip hop artists. Masao Inaba from Revelations: Persona wears one. Toronto Maple Leafs goalie Jonathan Bernier wore a tuque over his helmet during the sixth annual National Hockey League Winter Classic on January 1, 2014. One of the more notable wearers of the tuque was Jacques Plante, the Hall of Fame goaltender for the Montreal Canadiens ice hockey team throughout the 1950s. During the 2003 Heritage Classic game (which was played at temperatures below −15 °C (5 °F)), another Canadiens goaltender, José Théodore, wore a tuque on top of his goalie mask. A 1984 Québécois film about an enormous snowball fight has the French title La guerre des tuques (The War of the Tuques). A town in Quebec is known as La Tuque, named after a nearby hill that resembles a tuque. During the 2000s and 2010s, the bobble hat remains popular among many celebrities, including American rapper Eminem and Dappy from British-Cypriot group N-Dubz. Santa Claus is often shown with a knitted cap or a sewn cap following the typical Scandinavian style knitted cap with a pom-pom, a trait he has inherited from the Germanic/Scandinavian tradition. 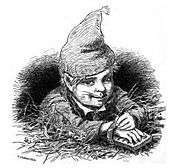 The Scandinavian tomte is likewise usually depicted with a red knitted cap, such a cap is also used as a national symbol (sometimes negatively) in Norway. Other names for a knit cap include: sock hat, knit hat, "bonnet", sock cap, stocking cap, tossel cap, ski hat, "toboggan" (Southern American English), burglar beanie, watch cap (American English), woolly hat, snookie, sugan, or chook. In parts of the English-speaking world, this type of knitted hat is traditionally called a "beanie" rather than the less popular "knit cap". In parts of Canada and the US, the word "beanie" is used to denote a completely different less floppy cap that is not knitted, but rather made up of joined panels of felt, twill or other tightly woven cloth (see Beanie (seamed cap)). The knit cap is also known in Canadian English: tuque (pronounced /ˈtuːk/; also spelled touque or toque in Canadian English), a word closely related to the French word toque, originally referring to a traditional headwear and now used for type of chef's hat (short for toque blanche, meaning "white hat"). A knit cap is commonly referred to as a "watch cap" by members of the United States military, as it is the head gear worn while "standing watch" on a ship or guard post. The term "snookie cap" is also frequently used in the US military. A knit cap with ear flaps is often called a bobble hat, toboggan, or sherpa. Wikimedia Commons has media related to Tuques. Look up knit cap in Wiktionary, the free dictionary. Look up watch cap in Wiktionary, the free dictionary. ↑ Shepherd, John (1991). The Crimean Doctors: A History of the British Medical Services in the Crimean War. 1. Liverpool University Press. pp. 296–306. ↑ Figes, Orlando (2012). The Crimean War : a history (1st Picador ed.). New York: Picador. p. 304. ISBN 1250002524. ↑ Flaten, Lillill Thuve ; foto: Morten (1998). Norske luer. Oslo: Orion. ISBN 8245803243. ↑ Barber, Katherine, ed. (2004). Canadian Oxford Dictionary, second edition. Toronto, Oxford University Press. ISBN 0-19-541816-6. — "Toque" is a main headword, "tuque" considered a variant spelling, "touque" does not appear. ↑ "Thousands vote on correct spelling of Canadian knit cap". CBC News. CBC News. December 9, 2013. ↑ Toque, tuque, bruque: What's the difference? ↑ Showing a lot of bobble. Danny Kelly, The Times. 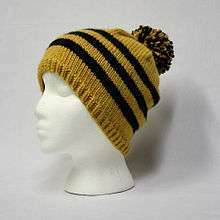 January 2, 2006 A recent columnist reminisced about attending a football match in 1969: "My Mum had knitted My New Hat. It was a navy blue and white striped bobble hat, quite like a million others worn by football fans everywhere." ↑ Patrick Murphy, John Williams, Eric Dunning. Football on Trial: Spectator Violence and Development in the Football World. Routledge, 1990 ISBN 0-415-05023-5 p.154. Football casuals are described as avoiding older fans, who are described as the "bobble hat and scarf brigade". ↑ Would you wear these trends?